I arrived in Cologne, Germany in the midst of the refugee crisis that is engulfing Europe, with Germany at center stage of the quickly unfolding situation. The fourth installment of the #AddColourToLives tour was, therefore, very timely, as it explored the refugee experience and the importance of social inclusion in a diverse society. 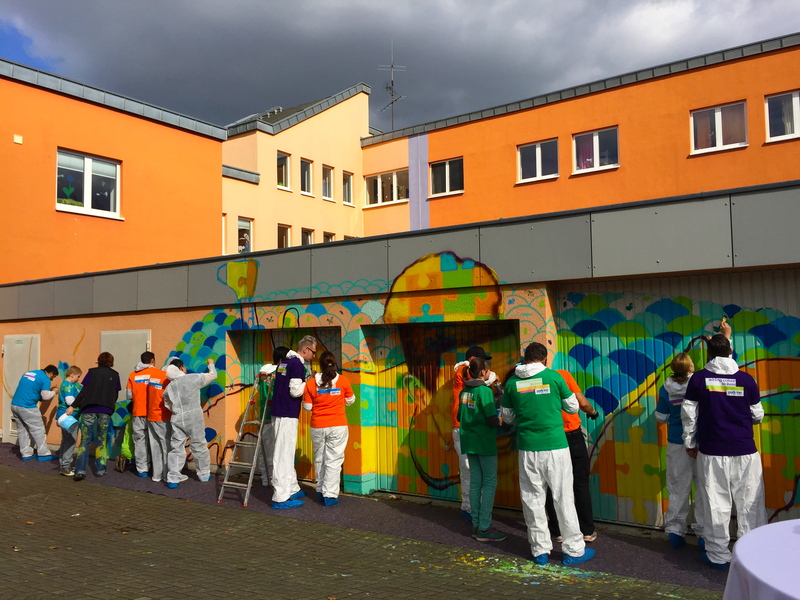 The project was a partnership between myself, the Cologne Park Inn hotel and the Anna-Stiftung center for children and teens who do not live with their families for a variety of reasons. Many of the teenagers who participated were refugees who had recently arrived in Germany- some only days ago- without any family. I tried to imagine arriving alone at such a young age in a strange land where no one spoke your language or understood your culture. They had experienced great hardships and trauma in the countries they came from in the Middle East, Central Asia and Africa, which they now had to attempt to recover from while dealing with the painful separation from their loved ones. The youth participants sketching their ideas during the mural design workshop. 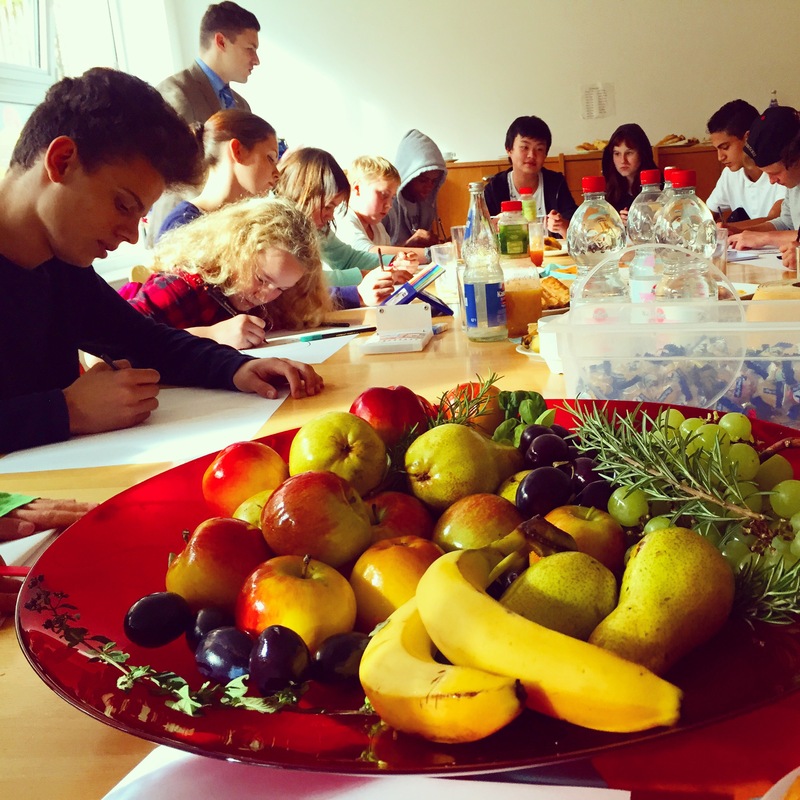 Needless to say, the language barrier was a challenge with this project, as many recently-arrived participants did not speak German like the other children and staff, nor English. But we made it work because of our great desire to communicate with one another,and the initial workshop was a great success. After games and activities and a presentation on community mural projects, we got down to the important business of designing a mural to be painted on the long outdoor wall of the center, which faces a busy neighborhood street. The youth decided to depict the migration experience as a river of faces flowing from dark grey hands, in reference to the difficult experiences that lead to a person leaving their homeland. As the river flows along, a teenager- modeled by a participant named Marwan from Western Sahara- drags a ball and chain behind him on his foot, but despite this baggage he is flying toward the a brighter future. He throws a paper airplane in the direction he is moving, representing the goals and dreams he is striving for. On the airplane the youth wrote questions the have for their future. Marwan is made up of puzzle pieces, which was one girl’s idea for a way to show that when one has been through trauma, it is as if one has fallen apart and needs to be put back together again. 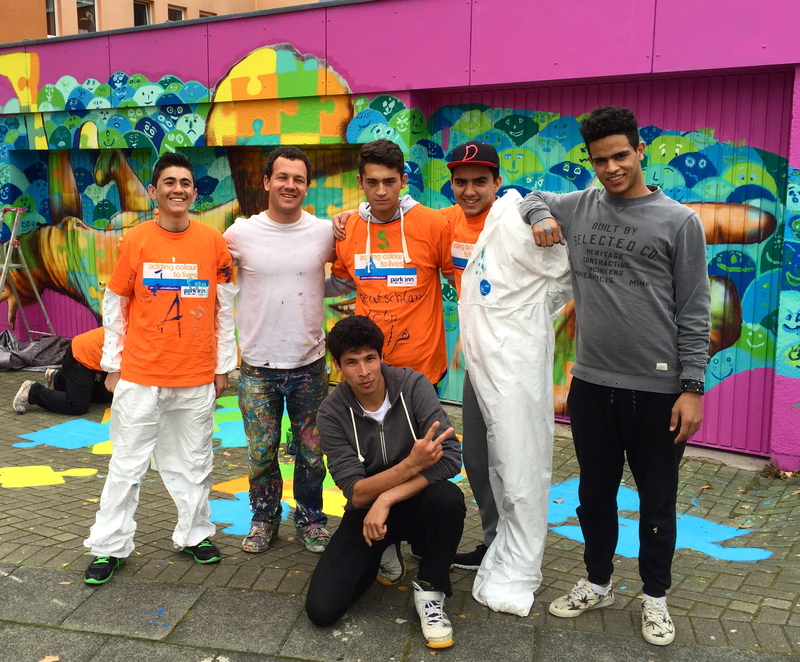 It was a massive effort to paint the big wall on outside of the youth center where they live in the remaining four days, but the kids were up to the challenge! They would paint starting after school each day, and many simply could not get enough, not wanting to leave each evening when it was time for dinner. One boy named Justin was obsessed with spray paint so we decided to make stencils so that the kids could use the spray paint to their hearts’ content on a wall around the corner from the mural. On the final day we had a big barbecue and enjoyed a beautiful sunny afternoon. Thanks to Mike and all the staff and youth participants at the center for the unforgettable experience, and also to my amazing hosts and collaborators at the Park Inn: Paul, Oliver, Ricarda and the whole crew! The whole crew gathered for our final event. Me with Mike, who has been working with the kids here for 10 years, doing amazing art projects with them and generally being an awesome father figure for them. Marwan, the participant who modeled for the main figure in the mural, working hard. I painted this piece in the lobby of the Park Inn as an homage to the hotel’s ongoing work with youth at risk. So many participants came together to make this thing happen! with the Park Inn crew!